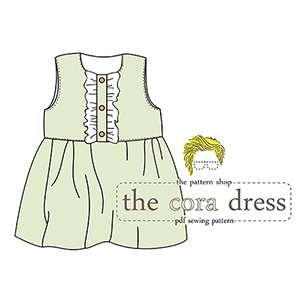 The Cora Dress is an easy fitting play dress your little one will hate to take off! Even better, with the full color illustrations and clear instructions even beginners can whip this one up in no time (and then another, and another, and another... ). 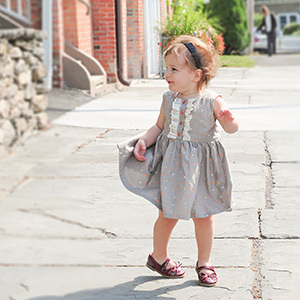 The finished dress snaps open in the front, has a cute ruffle detail, and is fully lined with zero exposed seams making for a durable dress that can survive wash after wash. As a bonus, even the largest size can be made with as little as 1 1/2 yards and some lining! This is a beginner to intermediate level sewing pattern. 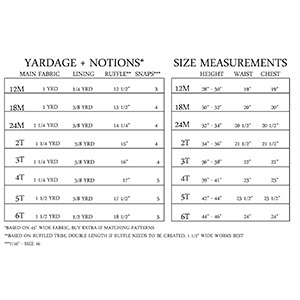 Suggested fabrics are cotton lycra, cotton jersey, and ponte de roma.